Sharon and her teenage granddaughter have learned how to eat without a heat source since a motel became their home. Sharon had never been homeless before. The bank took the home she and her granddaughter were renting around Christmas time last year. The landlord had not been paying the mortgage and by the time Sharon found out, she had just three days to move out with her eighth-grade granddaughter. She had nowhere to go. 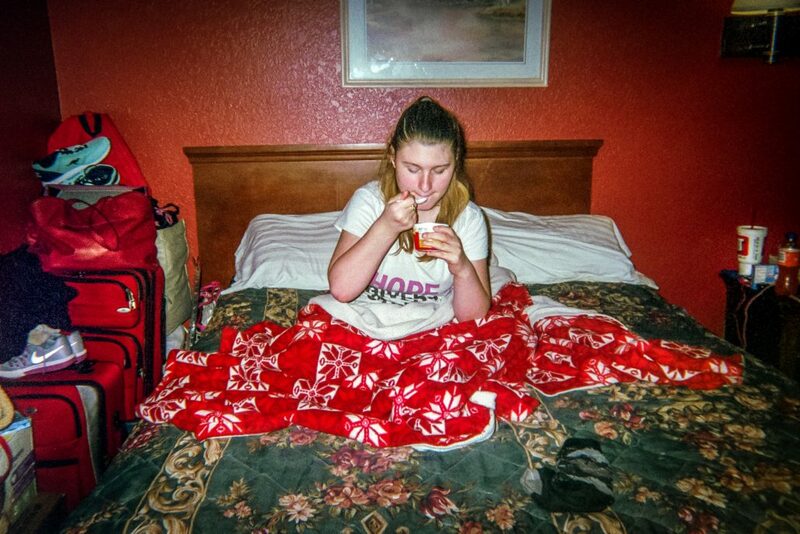 Sharon and the 14-year-old, Mattie, have been staying in a small hotel room for several months. Without any way to cook a meal, Mattie eats her spaghetti-o’s cold, directly from the cup. With no kitchen table, the bed becomes not only a space to sleep, but a place to eat. “We had to transition to eat differently without a stove or heat source to cook,” said Sharon. Mattie washes the dishes in the bathtub because there is nowhere else to clean the dishes. Sharon participated in the project, In Plain Sight, in hopes that churches and other agencies could raise money to help more people who are in her same situation. “Just because you’re homeless doesn’t mean that you didn’t pay your bills, or make bad choices with drugs and alcohol,” said Sharon. Sharon had a stroke that caused her to lose part of her eyesight. She also has a knee that needs to be replaced. The small amount of disability she receives from Social Security Income is not enough to take care of her bills and support Mattie. Her income barely pays for the hotel room. One might think that a hotel would be more expensive than an apartment. However, utilities, rent deposits and credit checks are often barriers too great for a homeless family to overcome when trying to secure an apartment. “There’s not enough money to get what we need,” said Sharon. Sharon dreams of having a car and a comfortable house where Mattie can grow up the way she deserves.